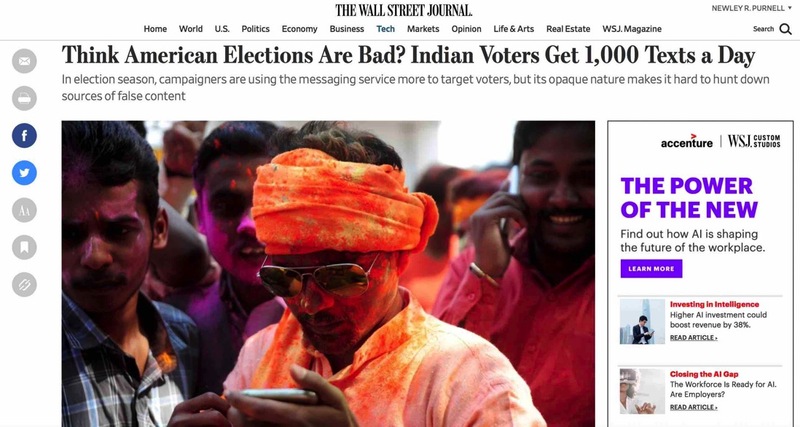 For Gurupad Kolli, a 40-year-old lawyer who lives in a remote Indian village, the torrent of WhatsApp messages surging to his phone a few weeks ago meant one thing: election day was near. He isn’t alone in his bewilderment. The rapidly falling cost of smartphones and mobile data in the world’s second-most-populous nation has turbocharged the spread of WhatsApp, where it is growing far faster than other social media and messaging platforms such as Twitter and Facebook. India is home to more WhatsApp users than any other country, accounting for more than 200 million of the 1.5 billion monthly active global users. That rivals the popularity in India of Facebook Inc., which owns WhatsApp. Tens of millions of Indians of all ages have made the messaging service, which is simple to join and use, their entry point to the world of digital communication, especially in poor, remote areas where users are flocking to the internet for the first time. Click through to read the rest.